Senior winter interclub entries close on Thursday 11 April. The competition starts on 29/30 April and runs for 9 weeks. The reaction to the announcement that George Crosby was taking over as squash vice president was mixed. There was muted euphoria from those of us who knew and liked him on one side and a baffled ‘Why are you guys so pleased?’ from members who didn’t. Over the last 18 months Paul Coll has taken the squash world by storm. And no doubt the double Commonwealth Games medallist and current World No.10 will have all his speed, power and acrobatics on display. West Auckland born and bred, Lance came through New Zealand’s junior scene with a cabinet full of trophies. In the senior ranks Lance has represented NZ at two Commonwealth Games rep and achieved a highest World Ranking of 89. Before the exhibition match, Paul and Lance will each take 2 x 45 minute coaching slots. Each session is $80. (These could be one-on-one, a pair or groups of 4). Herne Bay Club members have exclusive access to tickets up until Wednesday 23 May. 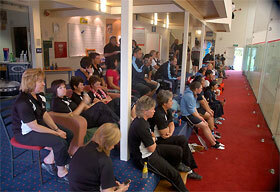 If any tickets remain, they will go on sale to the Auckland squash public. (So be quick). All court bookings are now displayed in our Online Squash Court Booking system. Please click on the link on the right hand side of this page to go to the bookings site. It's official: squash leaves tennis, cycling, running and rowing for dead when it comes to burning calories. And you never have to worry about the weather. 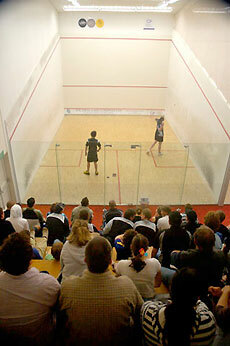 To top it off, we have some of the best squash courts in all of Auckland. The first thing to do is show up at Club Night (each Thursday from 6:30pm) for some social squash with other Club members. A grading can be arrange from our Squash VP if you want to compete in interlcub or tournaments. What's the story about interclub? Once you've got a grading you're ready to play interclub, the home and away team's event played one night a week. Home teams always put on the after-match spread, so although it's competitive, interclub's fairly social too. Sure, as long as you play them outside peak hours (4pm - 8pm) and remember to pay the visitor's fee of $20 . After 3 visits you should probably start dropping a few hints about becoming a member too. Fill in one of the visitor's fee envelopes outside the club office, stick in $20 for every 45 mins played, then leave it at the bar or slip it under the door of the Club office. Payment can be made by EFTPOS at the bar when open. You should be able to find a spare court most of the time. But the courts do get booked for tournaments, interclub and juniors. So check the notice board at the club as well as the calendar of events . Better still make a booking. The squash lights are operated on a panel to the right of the Pro Shop. You'll need two members' swipe cards to turn them on during peak hours (4pm - 8pm). Off-peak, you only need one member's swipe card plus the swipe card on the chain to the left. As with most sports, squash can be damn frustrating if you're constantly making unforced errors. Grab a few tips on technique, ring craft and more from our resident professionals, and chances are you'll enjoy your squash a whole lot more. Details below. Our coach Priscilla Wildsmith has represented New Zealand in squash, she has played on the PSA circuit and is an A grade squash player who has won several National titles. She has been coaching for the last 10 years running group coaching and private lessons both in New Zealand and overseas. She will be available for Private lessons and Group trainings so if you are interested in improving your overall squash game in a social environment get together a group of friends and set up a group session with her. Group sessions are fun and will improve your fitness and skills dramatically. Our coach Jarrod van Driel has many programmes and opportunities on offer for all ages and levels of junior squash players. This includes programmes such as Afterschool Programmes, Junior Interclub Coaching, Fitness Programmes, Academy Programme, Individual Coaching Programmes, and many more. Jarrod van Driel was awarded as the Squash New Zealand Coach of the Year in 2017, and the Squash Auckland Coach of the Year in 2016. In 2013 he was awarded Squash New Zealand New Coach of the Year in 2013, and was a finalist of the Squash New Zealand Club & School Coach of the Year in 2014, 2015, and 2016. Jarrod is an experienced and qualified squash coach, with over 15 Squash New Zealand Coaching Qualifications. Jarrod has coached many players who have ranked top in NZ and Auckland for points improvement, with players improving over 1900 points in under one year. He has also coached many players that have ranked highly in NZ and Auckland, as well as having coached two Superchamps teams to national victories. For details on weekly, quarterly, and annual packagesclick here.